Bethany reviews ‘Kyle’ by RJ Scott. Published by Love Lane Books on August 29, 2016. 150 pgs. Why I read this book: This week was Nothing But Angst week at RGR and I was told this one had a bit of angst in it. Note: We were provided a copy of this in exchange for an honest review. Kyle begins to see how far he’s come from being the scarred man who shut everyone out, when the first person through the doors of Legacy Ranch is Jason, a young man with nightmares that follow him when he’s awake. Lost in the system and with three years on the streets marking every inch of his body, Jason Smith is scared. His life is an evil mess of hate and despair, and even the offer of a fresh start and a clean bed isn’t enough to make him feel safe. Until Kyle comes into his life and shows him that it’s okay not to be in control. This week was angst week and I wasn’t sure what I wanted to read. I need to be in the mood for angst and the angstier the book the more hand holding I need – usually by my friends who have read it before and can guide me through it. When we got the review copy of Kyle and after reading the blurb I went to FB and asked if this one had any angst. Well RJ responded to me saying that, yes it did have angst, but how much…? She would let others answer that. So when a few more fans replied that, yes it had some major angst I thought I would give it a try. So here is the thing, I absolutely LOVE and ADORE her Texas series, for a few reasons. One is I was born and raised a Texas girl so when a book is based in Texas or characters are from Texas, well, it just makes me a little be happier. Second is I fell in love with Jack & Riley years ago; I can’t tell you how many times I have read the Texas series. And when RJ came out with a new series featuring new characters set in Jack & Riley’s world, well it was a given that I would be reading it. Cause really? Its RJ Scott, I am a total fan-girl and have read quite a few by her. But really, what was she thinking telling me it “did” have angst? Because I don’t think I breathed a sigh of relief till 90% in the book. No, I am not even kidding with you. My heart broke from page one till almost the very end. I hurt so much for these two men and for a lot of the book I wasn’t sure they would be able to get past their demons and get to experience the happiness they both so deserved. Kyle, well Kyle is how I would describe a dog that has been abused his entire life. Timid and scares easily when someone gets too close. And you know what? After hearing what happened to him, I do not blame him one bit. Heck, I’m shocked he wasn’t curled up in some corner in the fetal position most of the time. Seeing where he and who he worked for, I think I probably would have been. 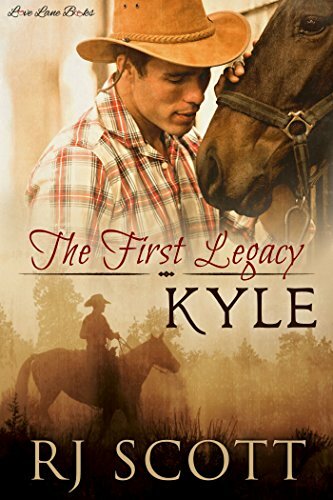 But it was wonderful to see Kyle come out of his shell on Legacy Ranch and trust that not all men are horrible people. Because Jack and Riley are two of the best men I have ever read about. And Jason, I wouldn’t call him so much a scared dog, no, Jason is a feral cat. Full of hiss and vinegar, yes I know the saying is piss and vinegar. But the hiss describes Jason to a T, hard to get close to and when he thinks you are in his personal space, he reacts the only way he knows how – to hiss and take a swipe at. And Jason’s background is no less tragic than Kyle’s, he just handles it differently. But they have one thing in common: they don’t believe they will find a permanent home. And let me tell yall, this broke my heart, no SHATTERED it. Oh, how I felt this need to hug them both till they believed they belonged. Not just at Legacy and Jack & Riley’s world, but with each other. It was not an easy road they had to travel, but watching them navigate it together, left me smiling and wanting more. I am not sure where RJ plans on taking this series, but I will tell you one thing, I for one am on board. This book broke me a lot and healed me even more. Just like she did for Kyle and Jason. I highly recommend this book if you want some hurt comfort and a little bit of Jack & Riley. But if you have yet to read the Texas series let me tell you this one can be read without reading the Texas series, but you will miss out on all the connections from the previous book. So in my personal opinion, get them all, you won’t regret them for a moment.